Girl Power at the Sifting Project! Today is International Women’s Day and I want to gloat about the amazing women working for the Temple Mount Sifting Project. We really have a special workplace because we have such a high percentage of women working here. With a lot of talk recently about women in STEM fields (science, technology, engineering, and mathematics), archaeology can sometimes be overlooked because many people associate it with the humanities. However, as someone who was required to take statistics for my archaeology major at Boston University, I can tell you that archaeologists regularly use the left side of the brain. What makes archaeologists so special is their ability to integrate the hard science and logic aspect of the field with the understanding of people, social structures, and the humanity side of the field. Women working as archaeologists are power houses and I am honored to call some of them my colleagues. Though many doubt us, we women can handle the rough days of field work getting dirty and processing finds, and the long days of research and analysis, the complex statistics and categorization of finds. My coworkers are creative and precise and manage to be some of the most genuine and kind people I’ve met. People who know our project know that our researcher Frankie Snyder is amazing. She is a mathematician and actually taught math in America. When she moved to Israel, she started volunteering at our project. Almost 10 years later, and she has come out with some groundbreaking research on our opus sectile tiles. Using geometry, material analysis, and comparisons with other Herodian sites, she was able to recreate the possible patterns of the floors of the Second Temple complex. She discovered what we call “Herod’s triangle” whose base is equal to its height, like a triangle constructed inside a square. This triangle with the unusual corner angles of 52°-64°-64° was very common in Herodian patterns but was rarely seen in floors elsewhere in the Roman world. When used in a pattern, the “Herod’s triangles” cause adjacent tiles to also have unusual, but mathematically recognizable corner angles. With math, ingenuity, and creativity, Frankie made one of the most amazing discoveries in Jerusalem archaeology in a decade. Frankie is just one of our many amazing women at the Temple Mount Sifting Project. We have had many female managers at the sifting site and we have a lot of female researchers and staff as well. Razia Richman does all of our detailed to-scale drawings of special finds. Nili Ahipaz is researching all of our coins dating from the Persian period (4th century BCE) to the time of the Arab Conquest in the 7th century CE. She is interested in how the symbols and inscriptions on coins can teach us about the beliefs and aspirations of the people who minted and used them. She is an inspiration to us, reminding us why we are studying these things, and not just identifying what they are. Me, Jenn Greene showing off some mosaic tesserae at the sifting site. Working with all of these amazing people, I feel like you can’t ever let anyone ever tell you that you can’t do something just because you are a woman. There are so many opportunities now for further education and experience and the biggest, hardest step is always the first step. I moved to London for my MA program at University College London and then moved to Israel and got my citizenship. Even though it has been difficult and completely foreign to everything I’ve done before, I have not regretted that first step for an instant. So women: Be brave. Be strong. Be yourself. *Note: We are currently looking for researchers in a number of different categories. Both women and men are welcome to apply and join our amazing team. Contact me at development@tmsifting.org. With the Nuba Inscription still fresh in our minds, this month’s Staff Spotlight lands on Peretz Reuven! Originally from Haifa, Peretz is our expert in the Islamic period pottery and artifacts. He originally got interested in the Islamic period while at Hebrew University. He began with Arabic and Islamic history, added in a bit of archaeology, and the rest is history. He has studied under some of the most widely published scholars, including Myriam Rosen-Ayalon, Rachel Milstein, and Hava Lazarus-Yafe. Now he works on many excavations and research projects across Jerusalem and Israel. Peretz was working on a project with Dr. Eilat Mazar documenting all the walls of the Temple Mount, and researching and publishing the large ophel medallion when he met our director, Zachi Dvira. Zachi invited him to join our project, and now Peretz is researching all of the Early Islamic period pottery found by the Sifting Project. He is also planning to use his experience in researching architectural elements from the Roman, Byzantine, and Islamic periods to research the architectural elements found in our sifting. The Early Islamic period assemblage from the Sifting Project is very rich in materials. We have a lot of ceramic vessels, many of which are glazed and elaborated. Though most of them are locally made, some were imported from Persia, Egypt, or parts of Europe. We can see that there was a lot of activity on the Temple Mount during that time period, but what is interesting is that many of the vessels are ordinary. For example, we have many cooking vessels and fragments of pipes. Peretz would not say that these vessels represent daily life, for example people coming and eating in an ordinary way, since the Temple Mount is a holy place. Rather, we are familiar with people coming to make celebrations on the Temple Mount as a part of Muslim fests and holidays. There were also people, such as guards, who stayed on the Temple Mount overnight, and our assemblage could represent their daily lives. Peretz does not have a favorite artifact among those that he is researching for the Sifting project because there are too many to choose from that are really interesting. Some artifacts are connected to the building of the Dome of the Rock or to the artists who made the mosaics adorning the Dome of the Rock and the Al Aqsa Mosque. 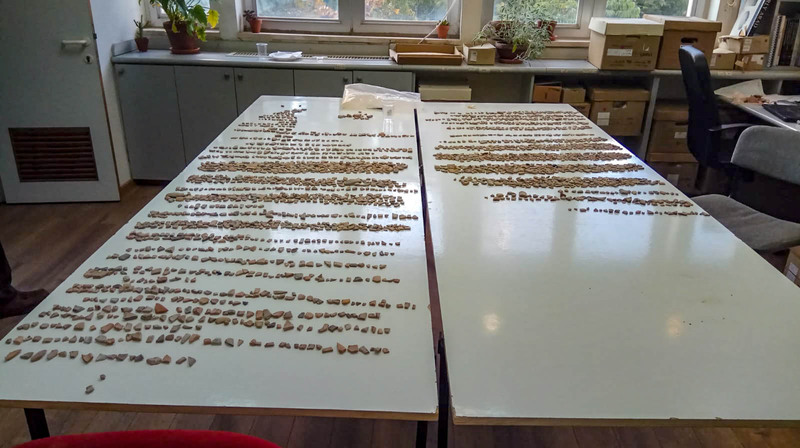 For example, Peretz is excited by the large amount of mother of pearl inlay found by the project. Many of these inlays might come from the dismantling and discarding of the mosaics over the years. Gilded glass mosaic tesserae from the Early Islamic Period removed from the Dome of the Rock exterior walls during later renovations. The buildings of the Temple Mount have mosaics inside and out. Some were dismantled during renovations while others were replaced because they were disintegrating or suffering from the elements. For example, all the outer surface of the Dome of the Rock was covered with delicate mosaics unlike the ceramic mosaics that we have today. In the 1500s, during the reign of Suleiman the Magnificent, all the outer paneling of mosaics were taken off the Dome of the Rock and thrown away. Most likely, some of what we are finding today is from that period. Between dumping and the stories of people cutting off the mosaics and selling or collecting them, it is really nice that some of these artifacts have survived. 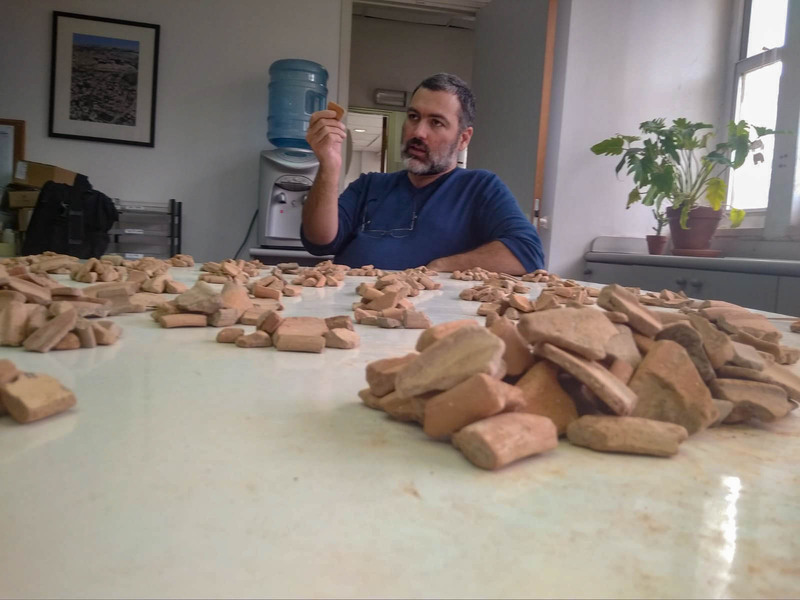 In addition to working with the Sifting Project, Peretz has just finished publishing his research on the Islamic period ceramics found in the Givati Parking Lot in Jerusalem and is now working on publishing his research on the Islamic material from the Western Wall tunnels and the Kotel. With Assaf Avraham, he just published his research on the Nuba Inscription. Peretz said that he has always been interested in the connection between Islam and Judaism. He and Assaf decided to do some research on the topic, and during that research Assaf found out about the interesting inscription in Nuba. They decided to do some additional research on the inscription and the results were definitely interesting. Check out the video they published on their finds.